Kentucky’s 2019 regular legislative session ended Thursday without progress on infrastructure funding. House Bill 517, a comprehensive infrastructure funding bill, died without a vote. Similar legislation was introduced in 2018 but likewise did not receive a vote. House Bill 517 would have increased the gas tax by 10 cents per gallon (cpg), created a new electric vehicle highway user fee of $175 (tied to the price of gas), and increased license plate renewal fees from $11.50 to $22 for passenger vehicles and from $9 to $15 for motorcycles, among other changes. If enacted, this legislation would have generated nearly $500 million in additional annual revenue for the Road Fund. However, with 2019 being an off-budget year for Kentucky, new taxes and spending would require supermajority approval in order to pass. Like many states, Kentucky faces a backlog of road maintenance and construction projects, and existing transportation taxes and user fees are failing to keep pace with funding needs. One reason for this is the value of the gas tax has eroded over time as rate increases have failed to keep pace with inflation. When Kentucky became the fifth state to adopt a gas tax in 1920, the tax was 1 cpg. Today, the state-levied gas tax is 26 cpg (including excise taxes of 24.6 cpg and a 1.4 cpg tax for underground fuel storage). 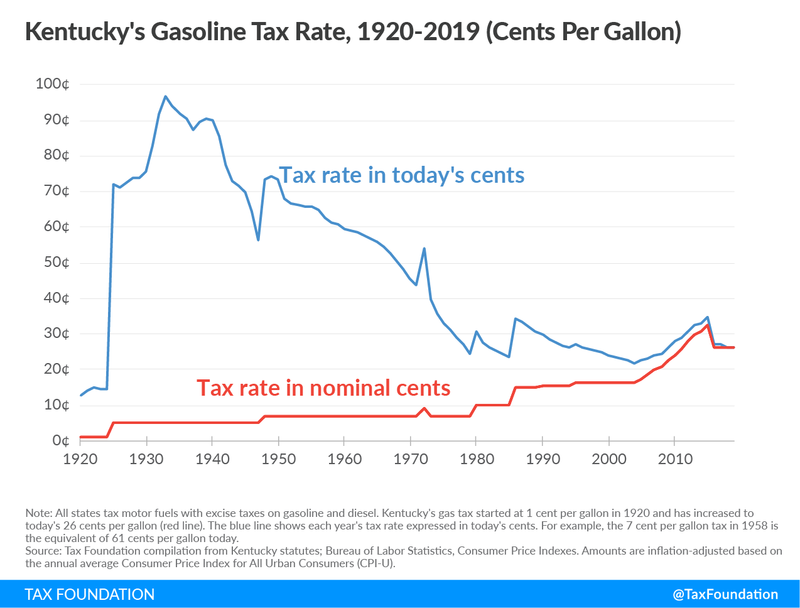 Kentucky’s statutory gas tax rate has been raised infrequently during its nearly one century in existence, and the tax is not indexed for inflation. As a result, the gas tax has lost much of its value over time. In 1967, for example, Kentucky’s gas tax had double the purchasing power it has today. Another factor contributing to Kentucky’s gas tax erosion is that the Bluegrass State is one of only 12 states tying its gas tax rate to the price of gas. Under Kentucky’s variable-rate gas tax structure, the state adjusts its gas tax on a quarterly basis according to changes in the average wholesale price (AWP) of gas. When gas prices fall, so does the state’s gas tax rate. When gas prices rise, the tax rate rises, but it is capped such that it may not increase by more than 10 percent per year. Some argue tying tax rates to the price of gas helps gas taxes keep pace with inflation, but inflation is just one small factor impacting gas prices. The price of oil is notoriously volatile, with gas prices constantly fluctuating based on changes in supply and demand, weather, geopolitics, and a variety of other factors. As such, when gas prices drop, Kentucky’s gas tax rate and collections also fall, and the Road Fund takes an unexpected hit. This issue came to the forefront when gas prices fell sharply in 2015, bringing Kentucky’s gas tax rate down by about 6.5 cpg between 2015 and 2016. To prevent the tax rate from dropping further, Kentucky lawmakers in 2015 adopted a tax “floor” of 26 cpg, where the gas tax currently stands. Variable-rate gas taxes not only make gas tax collections more volatile but also weaken the link between road usage and taxes paid. Generally speaking, gas taxes, tolls, and other similar transportation user taxes and fees adhere relatively well to the benefit principle, or the idea in public finance that taxes paid should relate to benefits received. However, variable-rate gas taxes inject a new variable into the mix: the wholesale price of gas. This weakens the relationship between taxes paid and benefits received, as drivers will end up contributing less to the Road Fund not because they drove less, but because the wholesale price of gas fell. Should Kentucky policymakers choose to revisit infrastructure funding in a future legislative session, it would be worthwhile to consider how a rate increase would help recoup the gas tax’s lost value, and how indexing the gas tax for inflation might be a better long-term solution than tying the tax rate to the wholesale gas price. The question of how to address base erosion and profit shifting has been a growing concern in recent years. It gained force around the world when the OECD published recommendations from the Base Erosion and Profit Shifting (BEPS) project in 2015. European countries face many issues that the BEPS project was intended to address. In fact, the challenges in Europe may be exacerbated due to the existence of the European Union (EU) and the single market. In this context, it may have been easier for any multinational corporation based in the EU to plan around member countries’ legislation to minimize its tax burden. The EU internal market consists of a single market made up of the current 28 member countries where each country allows the free movement of goods, services, capital, and persons. With all those freedoms in a single market (including the freedom of establishment), there are ongoing concerns in the EU Council about tax avoidance by multinational businesses and its impact on the tax revenues of its members. In June 2016, the EU Finance Ministers reached an agreement to lay down a common set of rules against tax avoidance practices that affect the functioning of the internal market. The project was named Anti Tax Avoidance Directive (ATAD). The ATAD policies were to be implemented by all member states no later than January 2019. ATAD is a set of minimum standards based on the work made by the OECD on the BEPS project. The standards include interest deductibility limitations, controlled foreign corporations’ (CFC) rules, rules to tackle hybrid mismatches, measures on exit taxation, and a general anti-abuse rule (GAAR). The purpose of the rules was to level the playing field in the single market and create a business environment with fair conditions for all EU members. With the incorporation of the rules, some EU members will lose the competitive advantages in attracting business investment that they gained prior to ATAD. Therefore, those countries could now appear less attractive to businesses in other EU countries. On the other hand, businesses that already have corporate structures in place across the EU will face additional layers of complexity from the compliance perspective, increasing the amount of compliance hours and the costs that the changes on the systems of different countries imply for them. While minimizing tax avoidance may be an appropriate policy goal, it is important that policymakers recognize the trade-offs with higher compliance costs and increased tax burdens on cross-border trade and investment due to ATAD. Though most EU countries have implemented each piece of ATAD, several countries are in various stages of implementing the rules. The rules on exit taxation are intended to prevent taxpayers from avoiding tax by transferring assets, permanent establishments, or moving their tax residences out of a member state’s taxing jurisdiction. This is done by taxing the excess of the market value of the transferred assets over their tax value. In the case of exit tax rules, 17 out of 28 members now have exit taxes. The ATAD deadline for incorporating the rules is the end of 2020. Cyprus, Czech Republic, Denmark, Croatia, and Malta are discussing legislative proposals to incorporate the rules. Other countries including Bulgaria, Greece, Hungary, Latvia, Slovenia, and Lithuania do not currently have a set of rules and will need to adopt them through their legislation. Denmark has exit tax rules that are applicable to individuals but not to corporations. A legislative proposal to enact corporate exit tax rules by 2020 is being discussed. Finland already has an exit tax, but it needs to be modified in order to comply with ATAD standards. Sweden has a rule to tax capital gains 10 years after a resident leaves the country. However, the Swedish government does not want to replace the 10-year rule with an exit tax. CFC rules aim to eradicate the incentive that many multinationals have to shift taxable income to a subsidiary in a low-tax jurisdiction where the company does not have any genuine economic activity according to EU standards. CFC rules are not new for many EU members. Some current member states had CFC rules in place in the 1970s and have been working to improve them through the years. Currently 27 out of 28 EU member states have CFC rules. Cyprus is the only EU member country that does not have the rules and will need to adopt them this year. Hybrid mismatch rules are intended to prevent double deductions or deductions without the corresponding inclusions by addressing mismatches between member states’ tax bases. The variation among EU member countries in definitions of taxable income allows some businesses to minimize their tax burden by taking advantage of various differences. As of March 2019, 22 out of 28 countries have a formal set of hybrid mismatch rules. Romania is in the process of implementing the rules, and the Czech Republic will conclude implementation of its rules by 2020. The GAAR allows tax authorities to look at business arrangements and determine whether the primary purpose of those arrangements is to gain an unintended tax advantage. These are generally arrangements that do not reflect economic reality or that do not have valid commercial reasons. Currently, 26 out of 28 EU members have a GAAR in place, though the Czech Republic and Latvia do not have a specific set of similar rules. The purpose of rules that limit deductible interest is to discourage companies located in various EU countries to reduce their taxable income by inflating borrowing among various business entities. Because interest is generally a deductible expense, some companies arrange financing structures between entities so that interest income is booked in a low-tax jurisdiction while interest expenses are booked in higher tax jurisdictions. The rules limit deductible borrowing costs by establishing a threshold in a set amount (above which interest is not deductible) or a percentage of the taxpayer’s earnings before interest, taxes, depreciation, and amortization (EBIDTA). Twenty-five out of 28 current EU members have one or more rules limiting interest deductibility. Austria has implemented a similar rule; however, the EU did not include Austria in the list of countries that have correctly implemented ATAD measures. Because of this, Austria may take further action to follow the EU standard. Ireland also does not have a specific interest deduction limitation rule. Cyprus will incorporate the rules by 2020. Countries including Germany, the United Kingdom, and France did not make any major changes to their legislation to comply with ATAD. In other cases, countries including the Netherlands, Ireland, Cyprus, and Luxemburg incorporated ATAD suggestions into their legislation for the first time. Source: Deloitte tax guides and highlights 2018, 2019. PwC Worldwide Tax Summaries 2018/2019. Even though ATAD sets out minimum standards for rules, each member state has the ability to enact different legislative approaches. The EU Council expects that tax planning opportunities in the EU will be reduced once all member states have implemented the rules. There will be immediate economic effects because of the enactment of the rules. The higher compliance burden will also affect multinational companies that operate in the EU. The Council of the District of Columbia is considering multiple property tax proposals with the stated goal of reducing the tax burden of homeowners who have seen their property taxes rise as home values have grown. The most efficient, economically neutral, and transparent way to provide tax relief is to simply reduce the millage rate across all taxable property. Reducing the millage rate would lower the tax burden proportionately across all properties, thereby distributing broad tax relief while preserving the property tax base and maintaining efficiency in the tax code. Some D.C. lawmakers are focused on ensuring that any property tax relief is done in a way that increases the progressivity of the property tax code. Two Council proposals reflect that focus, but also raise concerns about tax base erosion and a loss of neutrality, simplicity, transparency, and stability. Between the two competing proposals described below, the better route is to simply increase the homestead deduction. This proposal could be further improved by achieving a portion of the tax savings through reducing the millage rate. Council member Brandon Todd (D-Ward 4) proposed a bill to raise D.C.’s homestead deduction from $74,850 to $125,000. That means that D.C. homeowners would be able to deduct an additional $50,150 from their taxable home value, reducing their tax liability. This is one way to provide property tax relief for homeowners while making the tax code more progressive, though it faces the downside of eroding the property tax base, thus reducing the stability of the tax code and having a nonneutral effect across homes of different values. Todd’s proposal, however, raised concerns in the D.C. Council regarding the distributional and revenue impact of an increase in the homeowner deduction. Specifically, some argued that the homestead deduction increase would give tax cuts for wealthy homeowners. Others argued that the city would lose a large chunk of revenue, $38 million in total, for needed public services. Council member Robert White (D-At Large) introduced an amendment aimed at replacing the increased homestead deduction with a refundable tax credit for lower-income residents that could be claimed against income taxes. This is done by creating higher caps and income eligibility for Schedule H, a refundable tax credit that offers property tax relief for low- and moderate-income renters and owners. The new amendment would increase the maximum credit from $1,000 to $1,500 and income eligibility from $50,000 to $65,000 (from $60,000 to $75,000 for seniors). Compared with an increase in the homestead deduction, this proposal would address property tax relief through the income tax code, with the actual tax changes being income tax changes. This would increase the complexity and compliance cost of the tax code, while reducing tax transparency. The net effect would also be progressive, though with higher compliance costs, less transparency, and more complexity. Increasing the homestead deduction is the better approach, and contrary to the concerns of opponents, would not disproportionally benefit the wealthy. In fact, a flat value exemption would disproportionately benefit lower-valued homes, and thus would increase the progressivity of the tax code. For example, take two properties (A and B) that have property values of $100,000 and $1 million respectively. A flat exemption of $74,850 would reduce the taxable value of property A by about 75 percent, while the taxable value of property B would be reduced by about 7.5 percent. Given that higher-income earners tend to own more valuable homes and lower-income earners tend to own less valuable homes, an increased homestead deduction will disproportionately though not exclusively benefit lower-income households. It will be a simpler change and provide broader tax relief. However, a large homestead deduction narrows the property tax base, which can reduce the stability and neutrality of the tax code as home values fluctuate. Given the District’s median home value of just over $600,000 in 2017, the proposed increase in the homeowner’s deduction would mean that 20 percent of the value of the median D.C. home would be removed from the tax base. The most efficient approach for tax relief would be to focus more on reducing the millage rate, which is currently at $0.85 per $100 in assessed value. This would provide broad property tax reductions without a loss in tax efficiency. It could be coupled with a smaller boost in the homestead deduction that would still increase the progressivity of the property tax code. The ideal magnitude of property tax relief should align with the city’s ability to control its spending and be provided while keeping the tax code as simple and transparent as possible, while preserving the property tax base from undue erosion.